Arriving on my doorstep this week, samples of the newest beer from the Spoetzl Brewery came labeled with a promise to deliver "a little something special from the little brewery in Shiner." Strawberry Blonde is beer No. 7 in Shiner's Brewer's Pride Series, following Haymaker Extra Pale Ale which debuted earlier in 2015. 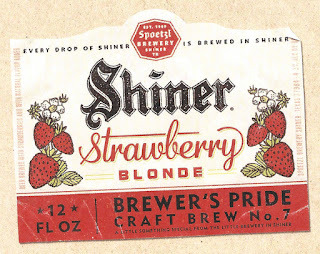 It's a lager brewed with fresh strawberries from Poteet, Texas, a little town about 40 miles south of San Antonio. Poteet, in case you didn't know, is known as "The Strawberry Capital of Texas," and the city hosts a festival dedicated to that particular fruit during harvest time each year (www.strawberryfestival.com). The beer, you might say, is a celebration of strawberries as well. To be sure, the berries are the dominant player, but the flavor of the fruit is balanced in and of itself. The taste is lightly tart and not too sweet, which keeps the beer from being too much of one thing and not enough of the other. Then again, no one would ever accuse Shiner of going way over the top with any of their beers, so maybe this is exactly what one should expect. Going beyond the fruit, the list of ingredients includes a mix of pale and wheat malts, which to me gives the beer a little bit of a biscuity character. It doesn't quite make for biscuits and jam in a bottle (though, the neck label does suggest you "jam out" with this beer), but the grain bill does provide what I'd call a pastry-like impression. On the tongue, Strawberry Blonde is light and refreshing, though it's perhaps somewhat overly effervescent. The carbonation is intense, to say the least, and while it's not all that evident based on the quickly dissolving head, as your drinking the beer the bubbles don't exactly dance across your palate. Despite that, at least in terms of flavor and the ability to slake your thirst on a hot summer day, Strawberry Blonde is a pretty decent beer. Of course, I'm not suggesting beer geeks are going to cast aside, say, New Glarus Strawberry Rhubarb in favor this brew, since it should be understood that the two breweries don't have the same target audience. Still, for someone looking to make their first foray into a fruit beer, I can't help but see Strawberry Blonde as a perfectly reasonable option. 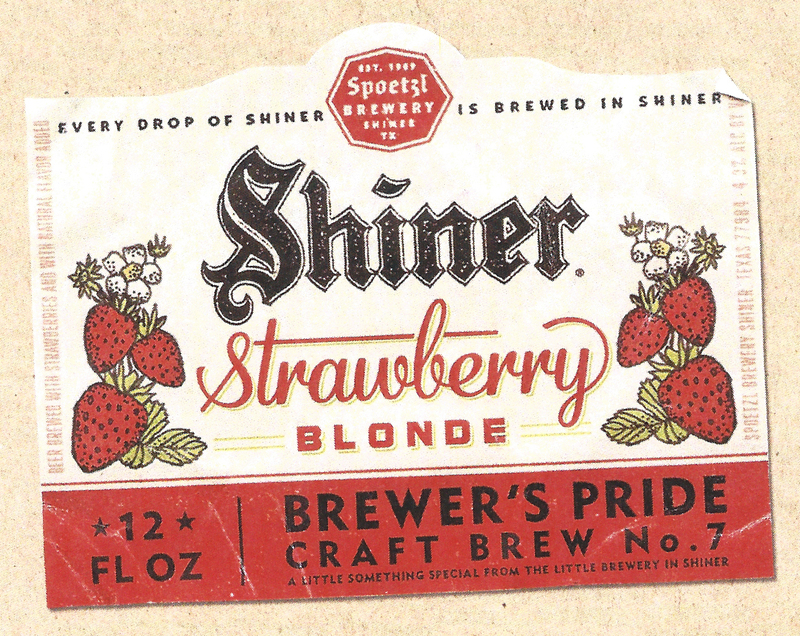 Strawberry Blonde will be released in 12-ounce bottles as part of Shiner's Family Reunion variety pack. It will also be available on tap and in 24-ounce bombers. Look for it wherever Shiner is sold.